The weekend of "What am I’s.."
BUT, it ain’t nasi lemak. Next articleWestin @ Jalan Bukit Bintang, KL – D & D get hitched! Really cannot guess lah – pray tell! The rice cooked also with coconut milk? Is that curry on the top? braised peanuts? looks like curry potatoes with rice? nasi liwet from Indonesia or some version of nasi lemak? smells like nasi lemak too? fusion hungarian beef goulash with rice? 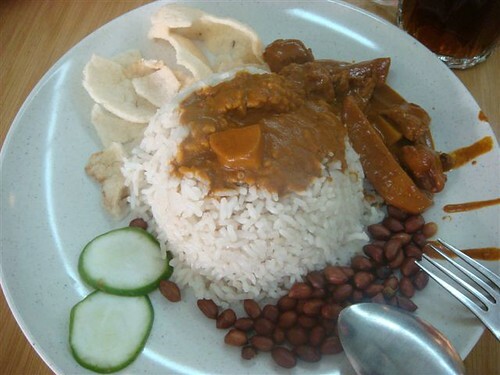 I put down 50 sen – it’s definitely kare rice malaysian style! why the cucumber doesn’t have seed?!?! it is vegetarian nasi lemak?